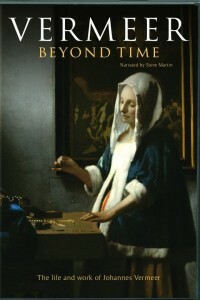 In the Vermeer Beyond Time DVD, the documentary explores the life and work of one of the most loved, influential, and well-known artists, Johannes Vermeer. Images from his paintings have become part of our collective imagination and are instantly recognizable and include pieces such as, “Girl with a Pearl Earring”, “The Astronomer”, and “The Geographer,” among others. The film is narrated by acclaimed actor Steve Martin (Father of the Bride, Three Amigos). French filmmaker Jean-Pierre Cottet adopts an imaginative and sensitive approach to Vermeer, focusing on not only his work, but also his family life. Cottet looks at Vermeer’s conversion to Catholicism, his artistic contemporaries, and the wider world of the short lived Dutch Golden Age of the 17th century. In 1675, overwhelmed by poverty, physically weakened, and humiliated, Vermeer dies at the age of 43. Soon afterwards, his paintings are sold to cover his debts, and Vermeer disappears from memory. His rediscovery some 200 years later has seen his popularity soar, claiming both our hearts and our admiration.